I'm writing a book called "How to Make an RPG", it tells you how to make a retro Final Fantasy style game from scratch. It's a big project! To hear when it's out please sign-up on the official How to Make an RPG page here. New Year's Eve 2013 I moved to Hong Kong. 2014 has been a pretty crazy year personally, last year on New Years Eve I arrived in Hong Kong for a new job. Moving country and taking on a new role reduced the time to spend writing the book. Overall progress has been slow but steady and that will continue into 2015. Getting equipped for the arena! The book is split into 3 or 4 sections. In 2014 I wrote the vast majority of the combat section and I also revised the code from the earlier exploration section many many times. As it stands there are maybe 20 chapters and around 80 examples projects! I really want the example projects to be as step by step as I can make them. The current game examples really feel like some type of Final Fantasy V / VI game so I'm really happy with how that's going. That's a lot of ground covered! It's been a continual suprised how many systems and how much content is present in even a modest RPG. 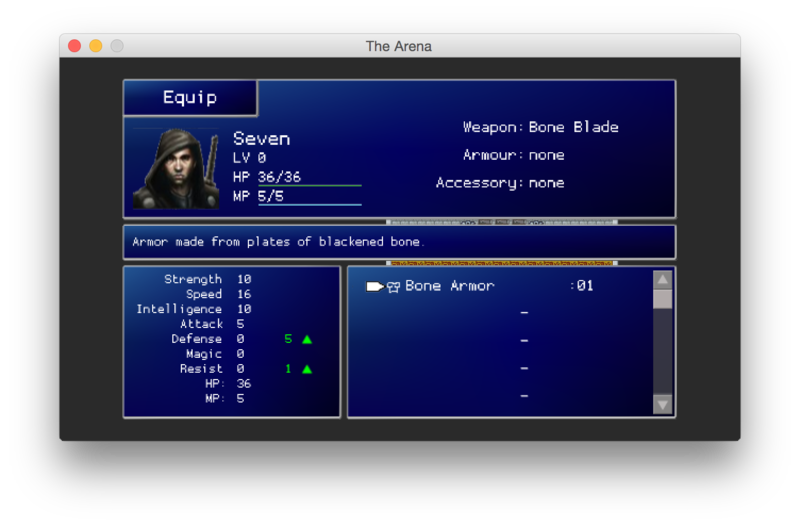 I'm currently finishing up the arena, it's completable now but it needs a little more polish and better graphics. Once the combat section is finished I'll coontinue on to the final section. The original plan was to write a questing engine that could be used to author any type of RPG at a high-level. I now think that's too ambitious (and would make this long book even longer!). Instead I think the last chapter will be putting together a small game. A town, an overworld map, a dungeon and a quest to retrieve a sword (or similar ancient treasure). I'll come back to the questing engine post-release. Once the final section is completed, I need to write some of the front matter and intro text. Then I'll have a first draft, I think I'll do a limited beta, then toy with the idea of kickstarter so I can buy a better quality of art. The first release will be shortly after this.